CrossFit Live was Dave Young’s version of CrossFit Radio from 2005 and 2006. This is the fourth episode from June 5th, 2005 with Robb Wolf of CrossFit Norcal. 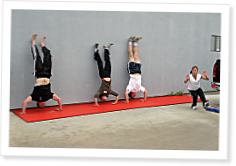 Pictured are Robb, Nicole Carroll, Dave Leys, and Annie Sakamoto doing Mary at the CrossFit Certification Seminar on Feb 13, 2005. Robb talks about how he got started with CrossFit before digging in to many of the common key nutrition issues related to performance. Among other things, he talks about the Zone, Paleo, intermittent fasting, as well as the hormonal impact of food. He takes questions from a variety of callers. Josh Bunch from Practice CrossFit saw Pat Sherwood’s Zone Chronicles episode from TGIFs, and disagreed with that meal being called anything but a cheat meal. Enjoyed this archive. Can you tell me what the supplements were that Robb recommends toward the end of the show? Creatine being one of them.